Terry Miller is a Connersville native originally from New Castle. 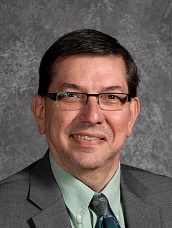 He is Director of Technology and Information Systems with the Fayette County School Corporation. Terry has two grown daughters, Allison and Melissa, and two gorgeous granddaughters, Amelia and Ada. He also has a dog, Pippen, and a cat, Cleo. Terry’s wife of 28 years passed away from inflammatory breast cancer nine months after diagnosis. His wife’s grandmother also passed away from breast cancer. He has many friends and co-workers who are breast cancer survivors or recently diagnosed. His wife’s experience with breast cancer was a very quiet and personal experience. As such, the family did not know a lot about the many resources and support available. Terry wants people to know what possibilities are in the community with support from Komen Central Indiana. It often feels tough, on top of battling breast cancer, the trip to becoming a survivor can be a lonely journey. Komen’s focus on a cure is a message for rural communities, like Terry’s, the community needs to know about. Favorite vacation spot: At the far east end of St. George island, Florida, after a 5-mile trek in a hefty four wheel drive Chevy truck across sizable dunes, there is the best isolated fishing spot. But be careful, the hammerhead sharks like to steal your big catch right of your hook. Random fact: Terry is a thespian and sings with barbershop quartets and a Capella groups. Other fun facts: He makes the most amazing sugar cream pies.